MALAKAS has weakened slightly and is undergoing extratropical transition. At 20 HKT, MALAKAS was centred about 700 km (380 NM) ESE of Sapporo. MALAKAS is the 108th name in the tropical cyclone name list. It was contributed by the Philippines, meaning strong and powerful. This name was last used in 2004. MALAKAS will move NE along the northwestern periphery of the subtropical ridge. MALAKAS is subject to high shear and extratropical transition will be complete in 12 to 24 hours' time. This is the final bulletin on MALAKAS. 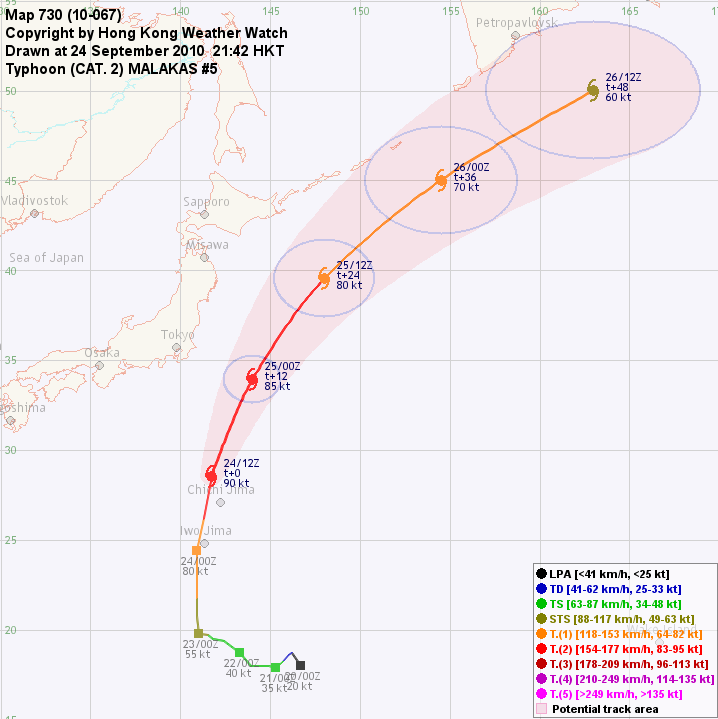 MALAKAS has intensified into a category 2 typhoon and developed a large eye. At 20 HKT, MALAKAS was centred about 420 km (220 NM) N of Iwo Jima. MALAKAS will gradually recurve in the northwestern periphery of the subtropical ridge. Forward speed will increase as it enters the westerlies. MALAKAS will encounter very strong shear soon and will start extratropical transition in less than a day's time. 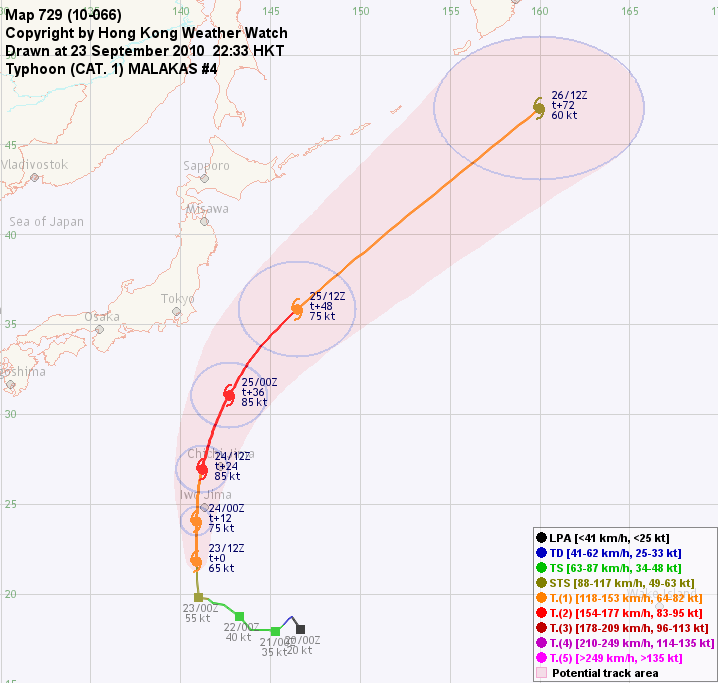 MALAKAS has intensified into a typhoon. At 20 HKT, MALAKAS was centred about 330 km (180 NM) S of Iwo Jima. A weakness has been created in the subtropical ridge. MALAKAS is expected to recurve through the break. MALAKAS's convections become symmetric and is developing a banding eye. It is expected to strengthen in the next 24 hours in generally favourable environment. 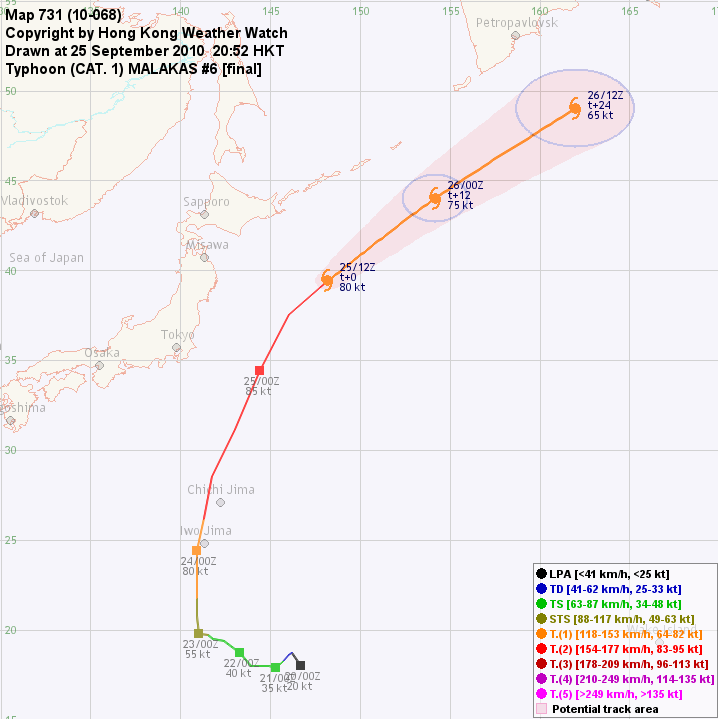 MALAKAS continued to move WNW. At 20 HKT, MALAKAS was centred about 590 km (320 NM) S of Iwo Jima. A mid-latitude trough is expected to induce a break in the subtropical ridge currently surrounding MALAKAS. This will allow a typical recurvature to occur. MALAKAS is expected to strengthen gradually in warm seas. Strengthening will be enhanced by the favourable poleward outflow as the trough passes to its north. 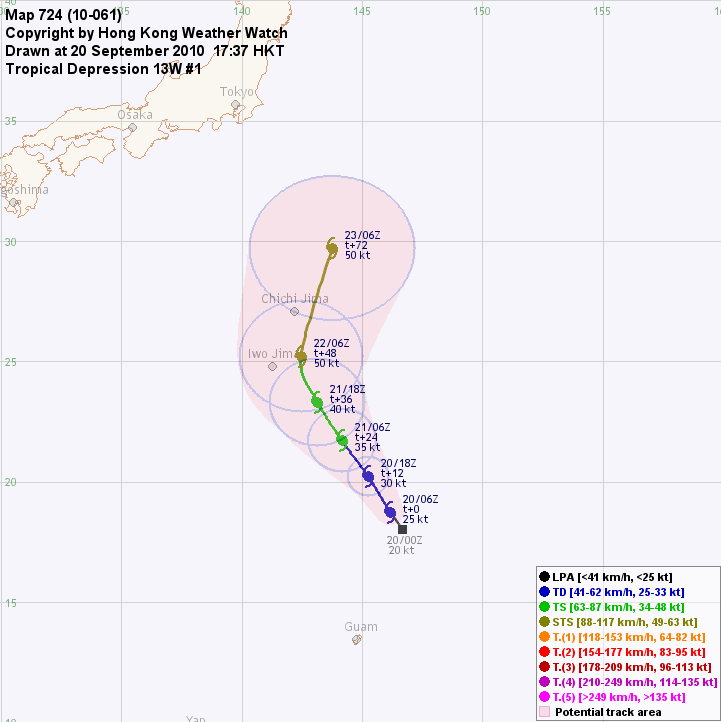 13W has intensified into a tropical storm and was named MALAKAS. At 20 HKT, MALAKAS was centred about 830 km (450 NM) SSE of Iwo Jima. Tropical disturbance 90W has intensified into tropical depression 13W. 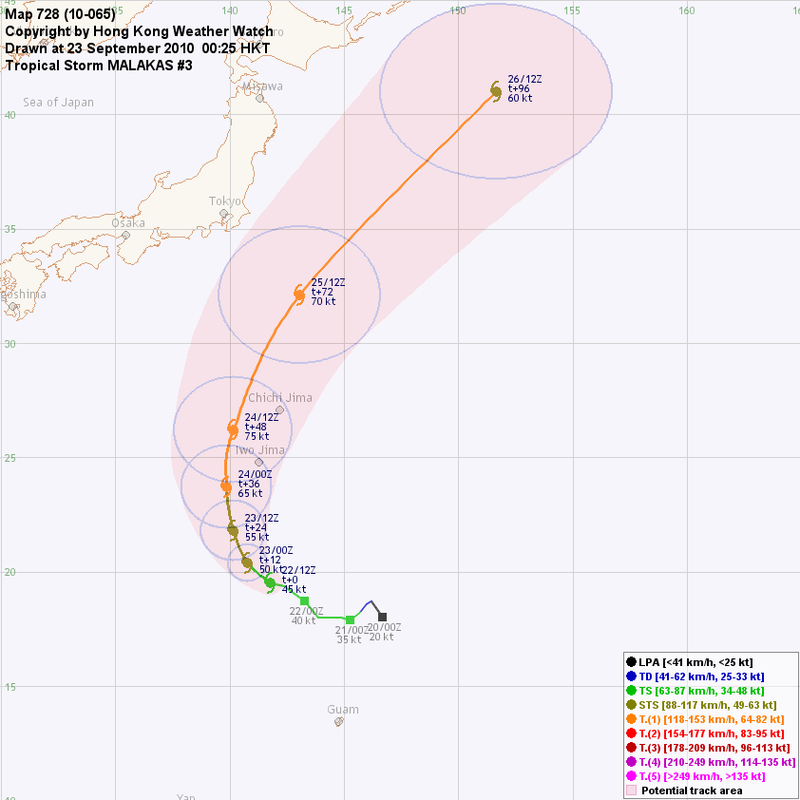 At 14 HKT, 13W was centred about 840 km (460 NM) SE of Iwo Jima. A mid-latitude trough is expected to induce a break in the subtropical ridge currently surrounding 13W. This will allow a typical recurvature to occur. 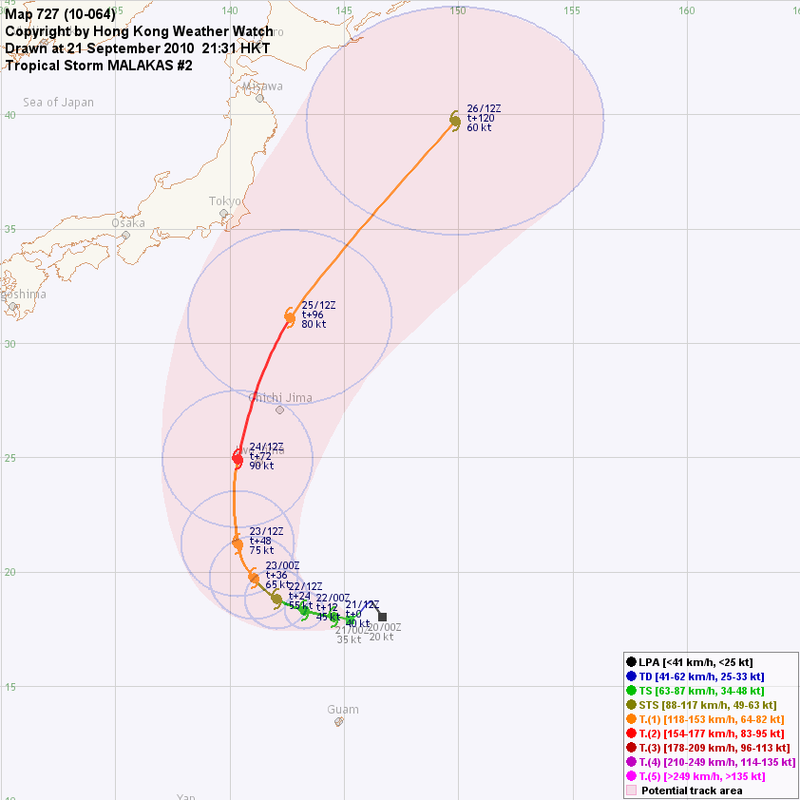 13W is expected to strengthen gradually in warm seas.